The riesling-infused Saar Dry Gin owes its name to the Royal Prussian District Forester Ferdinand Geltz, the historical figure who also co-founded the VDP Mosel-Saar-Ruwer grower’s group. Carefully hand-picked riesling grapes from the steep shale slopes of the Zilliken estate on the grand Saarburger Rausch, site make the gin a unique tasting experience. The craftsmanship of Master Distiller Andreas Vallendar, and over 30 finely balanced botanicals taken from the vineyards guarantee a high-quality product from the Saar region that promises supreme drinking pleasure. The Vallendar family has been distilling spirits for several generations on their estate which was founded in 1824 in Wincheringen. Master Distiller, Andreas Vallendar, has been living his professional dream for years now, with passion, enthusiasm, but above all with dedication, precision and great pride in his work. The raw distillate produced from our own grain is distilled several times, with an additional steam infusion of freshly harvested herbs, Vallendar, adds a uniquely fresh floral note to the gin which is rounded off with a precise measure of Schiefer Riesling. 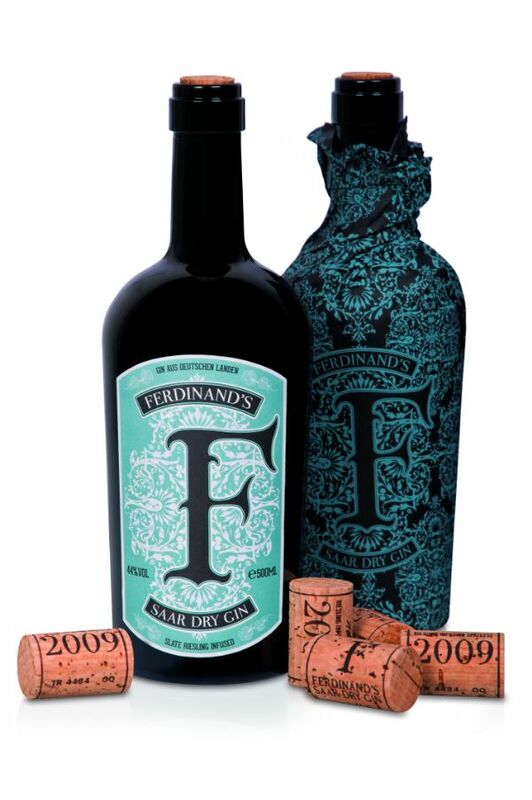 Having been left to the rest for a period of four weeks, Ferdinand’s is proofed to a drinking strength of 44% ABV, using de-mineralized water, then filled into nostalgic-looking wine bottles and enclosed with a natural cork sealed in beeswax. The herbs, spices and fruits used in the gin are delicately balanced and are mainly cultivated onsite. All botanicals are hand-picked. Directly behind the distillery stand quince trees, which produce richly flavored fruit; the lavender comes from fallow vineyards in the Konzer Tälchen valley and the lemon-scented thyme is grown in their own garden. Along with the basic ingredient of juniper, other regional ingredients such as rosehip, angelica, hop blossom and rose are equally important constituents. The tri-border region between Germany, Luxembourg and France at the heart of Europe gives rise to an exceptional hand-crafted product from two traditional producers whose methods have already shaped this region's style and reputation. Independent of their mutual friendship, they all instantly agreed on one point: they wanted a gin that reflected their own region with an emphasis on quality. Only the highest-grade late and select harvest wines from the large Saarburger Rausch vineyard site are used for the gin's wine infusion. Highly aromatic herbs and fruits, both from the Saar region and from the incomparable steep shale slopes (vineyards) of the Saar, round off the flavor. Ferdinand's Saar Dry Gin combines the best of this beautiful region.